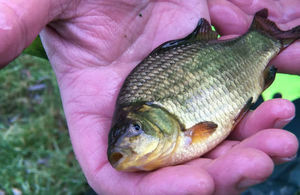 Thousands of roach, bream, chub, tench, crucians and dace find homes in Clevedon, Burtle, Parchey, Yeovilton and Frome. Thousands of fish have found new homes just in time for Christmas thanks to the Environment Agency’s Christmas restocking of Somerset’s rivers. Every year, the Agency’s Calverton Fish Farm, near Nottingham, breeds fish of many varieties to repopulate England’s rivers. Agency officers from Bridgwater’s fisheries team spent a busy day on Friday 14 December putting 7,800 fish into the Blind Yeo near Clevedon, Burtle Road Lakes in Burtle, and the King Sedgemoor’s Drain at Parchey. Restocking will conclude on 19 December with 6,300 fish introduced to the Somerset Frome in Frome, which lost a large number of fish after a slurry spill in 2016. We encourage anglers to enjoy fishing through the festive holidays. A fishing rod licence also makes an excellent Christmas gift for someone who doesn’t have one but wants to give it a go. The work of our National Fish Farm is funded by income from licence fees, so in the lead up to Christmas it’s great to see the fish farm continuing to produce strong and healthy fish needed for re-stocking and recovery. In the first 4 weeks of the stocking season (14 November to 14 December) 143,000 fish reared for up to 18 months have been driven from the fish farm in Nottinghamshire and released into 41 still waters and 30 rivers, with plenty more planned for the coming weeks. The restocking activity is part of an annual programme, funded by income from rod licence sales. Restocking occurs in winter because water temperatures are low and this minimises any stress on the fish, giving them the best possible survival rates. Restocking is done where numbers are low, have been depleted following a pollution incident or to create new fisheries and opportunities for anglers. You need a rod fishing licence to fish for salmon, trout, freshwater fish, smelt or eel with a rod and line in England. Get yours from https://www.gov.uk/fishing-licences. The 7,800 fish restocked included 3,000 roach, 2,000 bream, 1,000 chub, 800 tench, 600 crucians and 400 dace. The 6,300 fish restocked will include 2,000 roach, 1,500 chub, 1,000 bream, 600 tench, 600 crucians and 600 dace.